Introduction: One of the cool things about this hobby is that the sky is not unchanging. Although we can’t predict when new goodies like bright comets and novae will occur, they do come around with fair regularity. Two years ago, when I was just getting into amateur astronomy, comet 17P/Holmes suddenly blew up to naked eye visibility. I just got an AstroAlert from Sky & Telescope about a nova in the constellation Eridanus, close to the bright star Rigel in Orion. Introduction: This is one you can’t do immediately after dark. But neither will you have to stay up obscenely late or get up obscenely early. By 9:00 or 10:00 PM, Orion should be far enough above the horizon to make this a cinch. The first step is to locate the constellation Orion. Orion is the most striking and instantly recognizable of all constellations, so it’s just a matter of looking southeast at the right time. Find the straight line of three stars between bright red Betelgeuse and even brighter Rigel, and you’ve got it. Lots of good deep sky targets in Orion, including the incomparable Great Nebula, M42, but those are missions for other evenings. Once you’ve located Orion, you’ll have to star-hop to the nova. 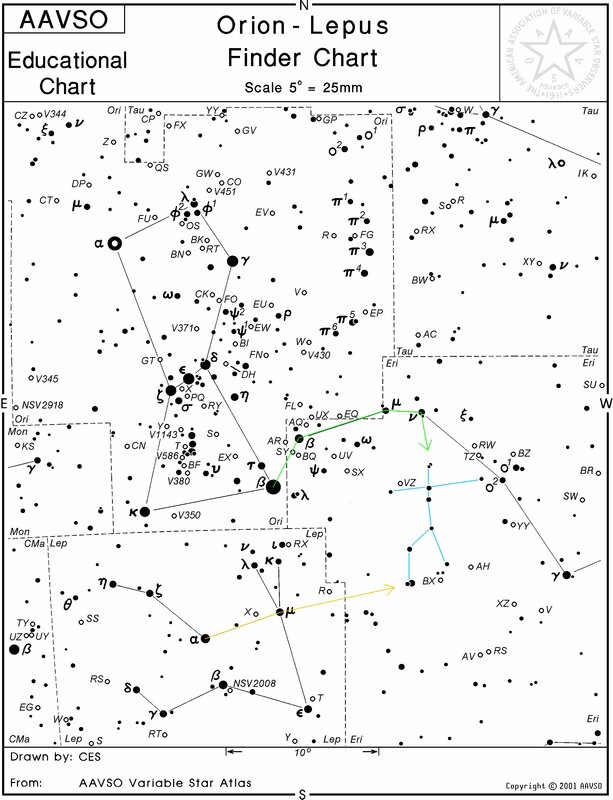 From Rigel, you can follow the arc of bright stars that marks the eastern end of the constellation Eridanus (green arrow). From the third star in the chain, drop down (south) to two close stars that mark the head of the stick figure shown on these charts. 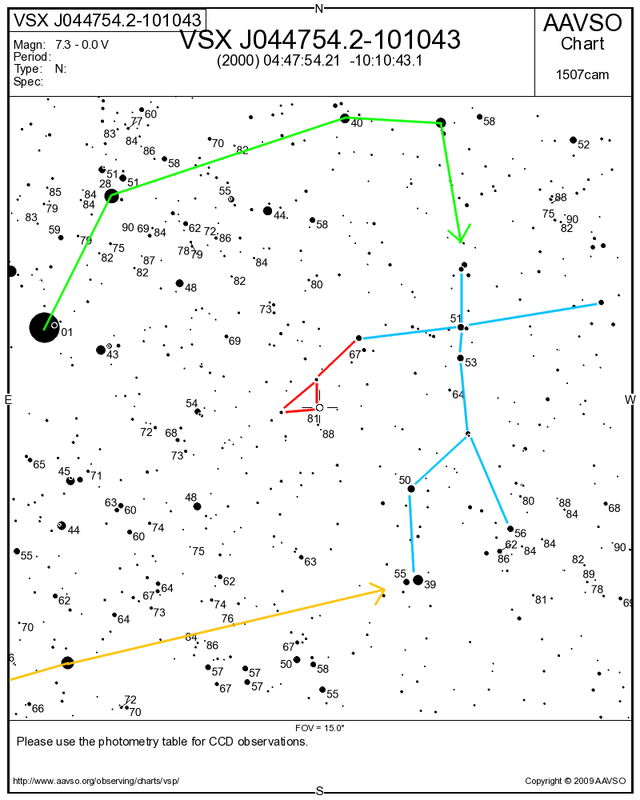 Alternatively, look south of Orion to find the stars that form the outline of Lepus, the Hare, and line up the stars forming the bunny’s shoulder and the top of its head to get to the stick figure’s left foot (orange arrow). A word about these charts: they were generated by the AAVSO, or American Association of Variable Star Observers, which has a gizmo for generating finder charts for practically all of the variable stars one might want to hunt down visually. I added the colored arrows, and the stick figure is just an asterism–a chance alignment of star–that I noticed and found useful. Star hopping is subject to individual preference, so if this way of getting there doens’t work for you, generate your own finder charts and find your own way. I don’t say that to be flip or callous; sitting down with a red flashlight, some blank finder charts, and a telescope and finding (and drawing) your own asterisms is very satisfying and a great way to learn your way around the sky. Another thing about the charts: many stars have a two or three digit number next to them. These are not identification numbers but magnitudes, so that variable star observers can determine the brightness of their target star by comparing it to other stars in the same field. Following standard practice, the decimal points are eliminated on the charts so they can’t be confused with stars. A star with the number 81 next to it shines with a magnitude of 8.1, too faint for the naked eye but within easy reach of binoculars. Back to the stick figure. Note that stars marking the head, heart, left hand, and left foot all have close companions, which should help you distinguish them from all the other stars out there. Once you’re sure you’ve got it, find a chain of three fainter stars trending southeast from the stick figure’s left hand. Nova Eridani 2009 forms a triangle with the outermost stars in that chain. Right now it’s shining around magnitude 8.4, so it should be almost identical in brightness to the star just below it marked 81. Don’t confuse them! 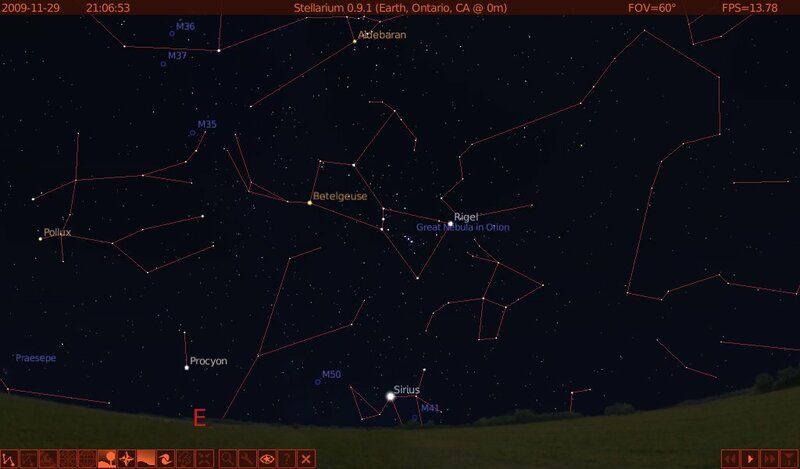 Also notice that the charts are all shown with north to the top and east to the left, just as this part of the sky looks to the naked eye, binoculars, and right angle correct image (RACI) finderscopes. Straight-through finderscopes, straight-through refractors, and Newtonian reflectors will show the sky rotated by 180 degrees. No problem, just rotate the chart upside down and keep on truckin’. 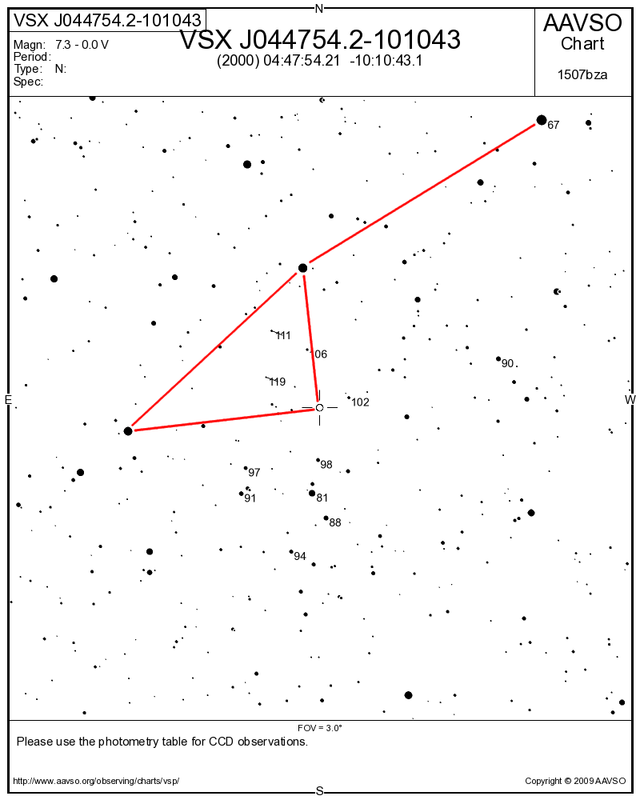 Refractors and cassegrain scopes using a star diagonal will show the sky rightside up, but flipped left to right. You can either flip the image ahead of time in an image-processing program, or do it mentally in your head, or–the oldest and easiest method–turn the chart over and shine a flashlight through from the other side. So what’s going on out there? Novae are giant thermonuclear explosions that occur when a white dwarf star accumulates enough hydrogen on its surface to undergo a chain reaction. Usually the hydrogen is slurped off the surface of a companion star, perhaps a red giant. This can happen over and over again; most novae probably “go off” once every 1000 to 100,000 years, and a few like RS Ophiuchi go off every few decades. This explosion of hydrogen on the surface of the star is in stark contrast to a Type 1a supernova, which also involves a white dwarf accreting matter from a companion. In those supernovae, the white dwarfs accumulate enough matter to approach the Chandrasekhar limit of 1.38 solar masses, at which point carbon fusion starts in their cores, followed by oxygen fusion, followed by total destabilization of the star. The star detonates in an explosion 5 billion times as bright as the sun, with a shock wave that travels at 3% of the speed of light. Neat trick, but needless to say, one that a star can only pull off once. Fortunately for us, Nova Eridani 2009 isn’t going anywhere. However, it will dim over the coming months, so get out there and see something new. For more info, see the Sky & Tel writeup and the AAVSO updates here, here, and here.